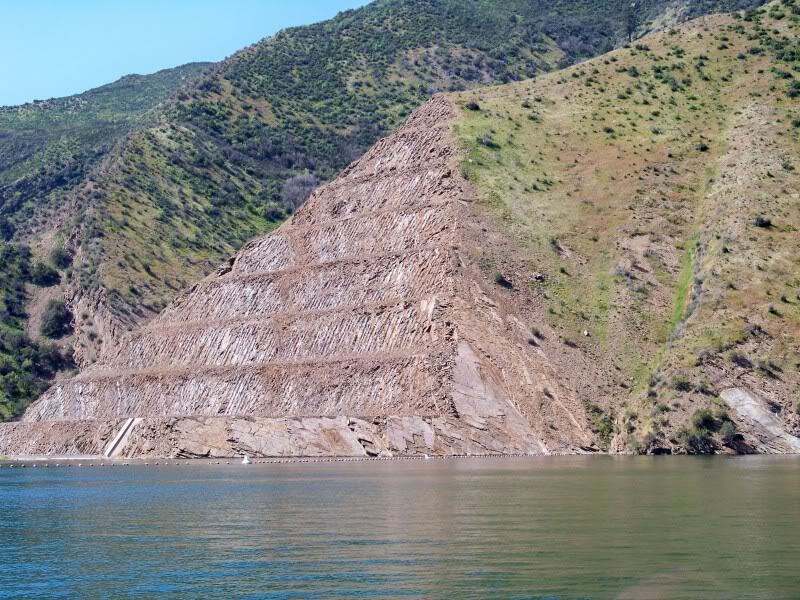 Pyramid Lake is located 22 miles north of its infamous neighbor Castaic Lake. 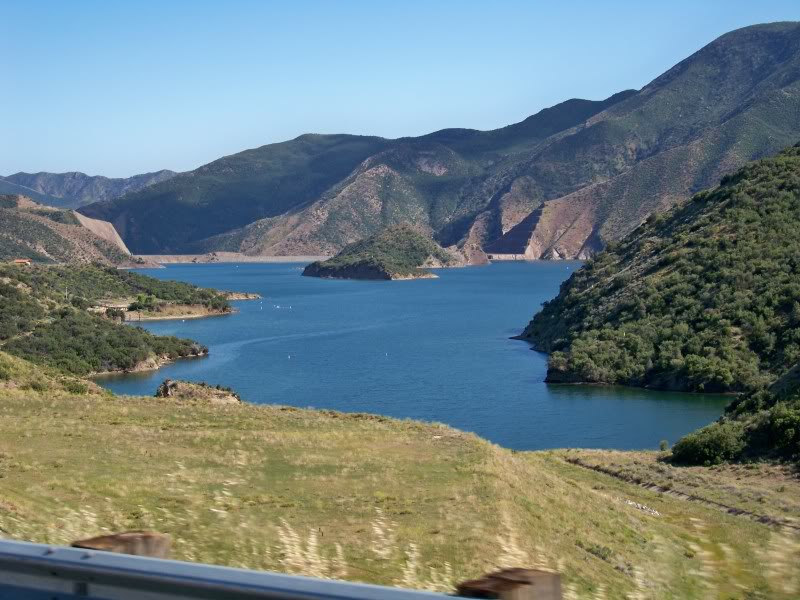 This southern California manmade lake is right alongside interstate 5 approximately 56 miles north of Los Angeles. 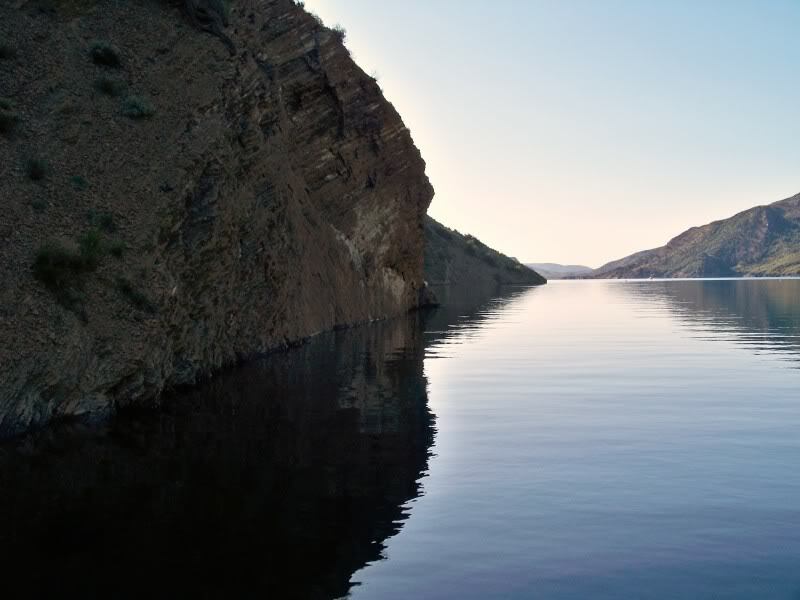 This deep canyon reservoir is upstream from Castaic; the two lakes exchange water to generate hydroelectric power. 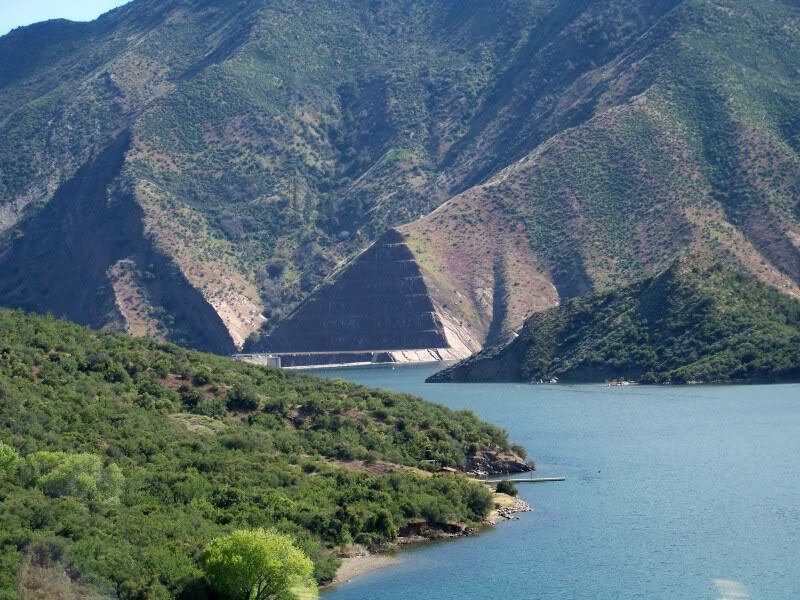 Completed in 1973 Pyramid was created by placing a dam along Piru Creek. The lake's namesake comes from this landform, Pyramid Rock. In 1932 this ridge was cut to allow for the construction of the 'Old Road' US 99. Pyramid's arid landscape has a unique beauty. 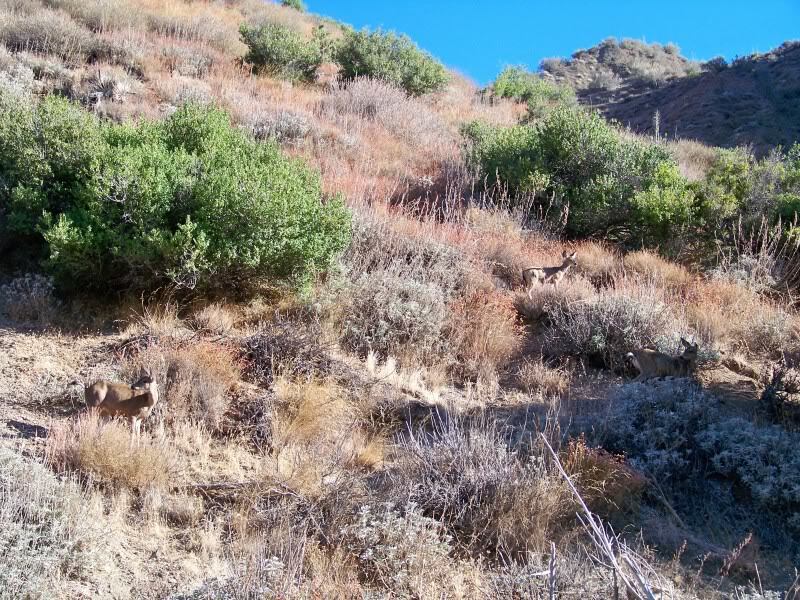 Like any body of water wildlife is abundant here; how many deer do you see. Fish are not the only animals to attack swimbaits. 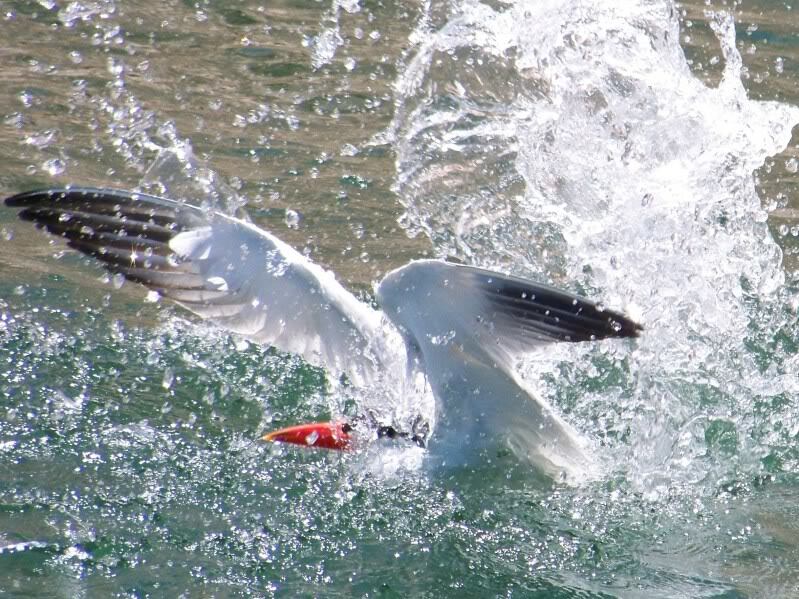 That is exactly what this Turn is doing, dive bombing and trying to catch my 6" slow sink. Due to this bird's persistence I had to leave the area. 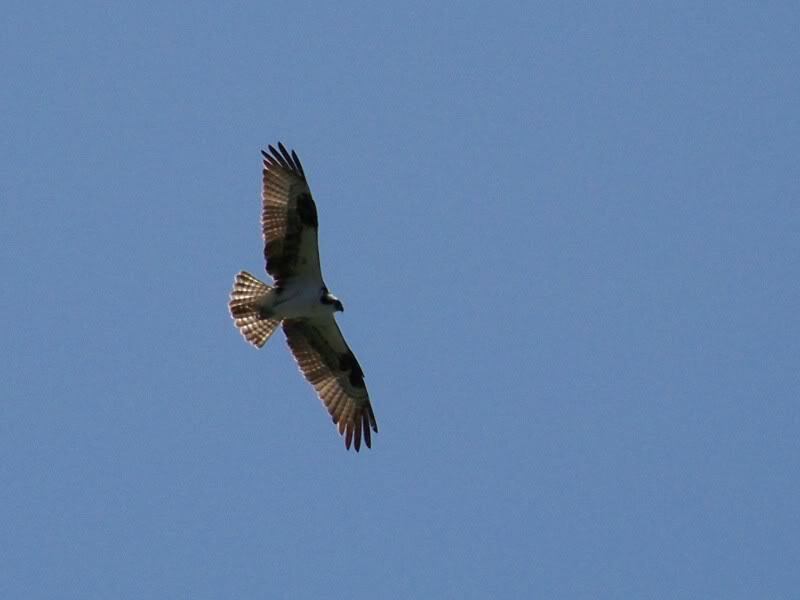 Another skilled angler Osprey Winged Talon. He has barbless stinger hooks! 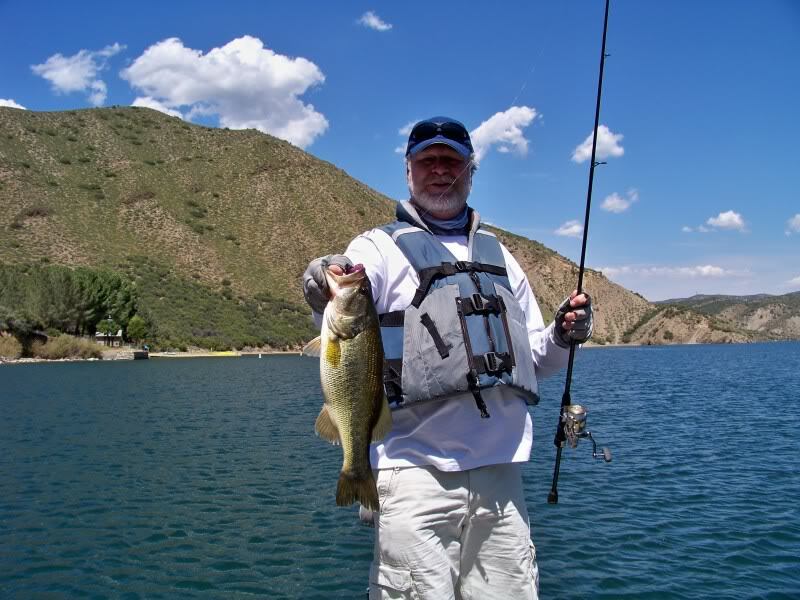 Pyramid is enjoyed by a wide range of anglers. 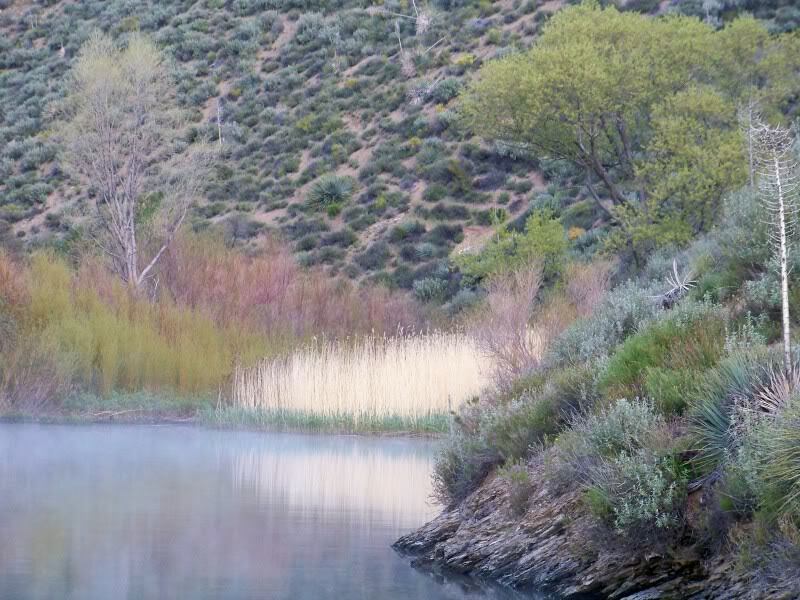 Visit during the week or the cooler months of the year and it will seem like you just about have the lake to yourself. This is a typical 'good' catch a largemouth pushing 3 pounds. 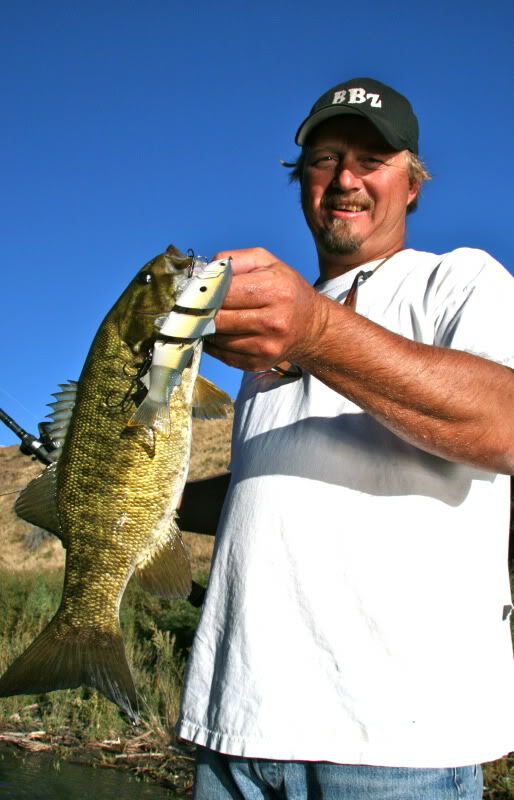 This bass was duped with a drop shot rig. A 4.5" straight tail morning dawn Robo worm soaked in craw smelly jelly with a #2 Rebarb hook rigged weedless on 6 pound fluorocarbon. 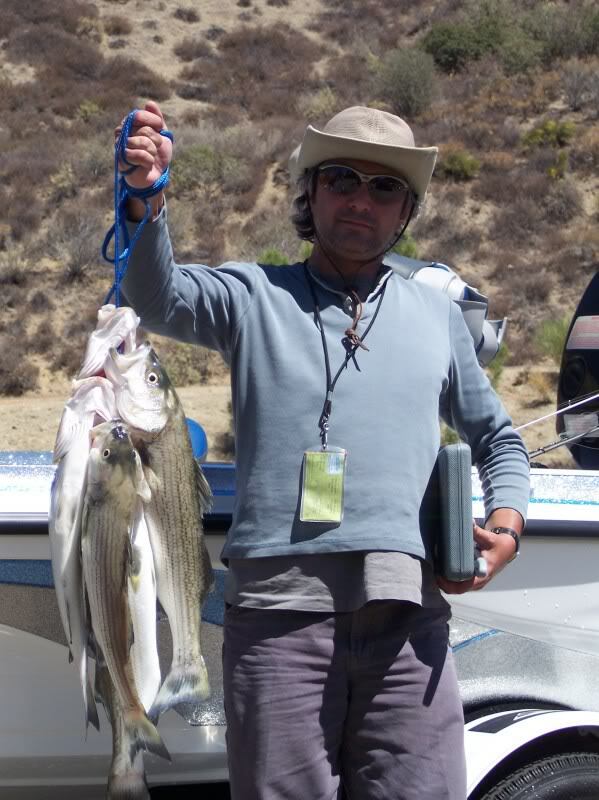 Taking advantage of striper boils this angler has his filet kit and is soon off to prepare some fish tacos. 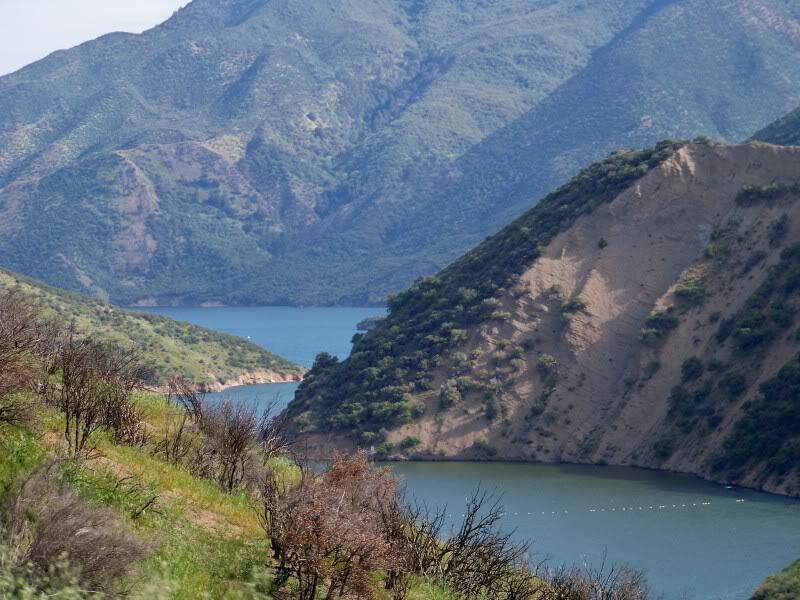 At around 2,500 feet above sea level the cooler season arrives sooner and lasts longer than most of the other lower elevation regional lakes. 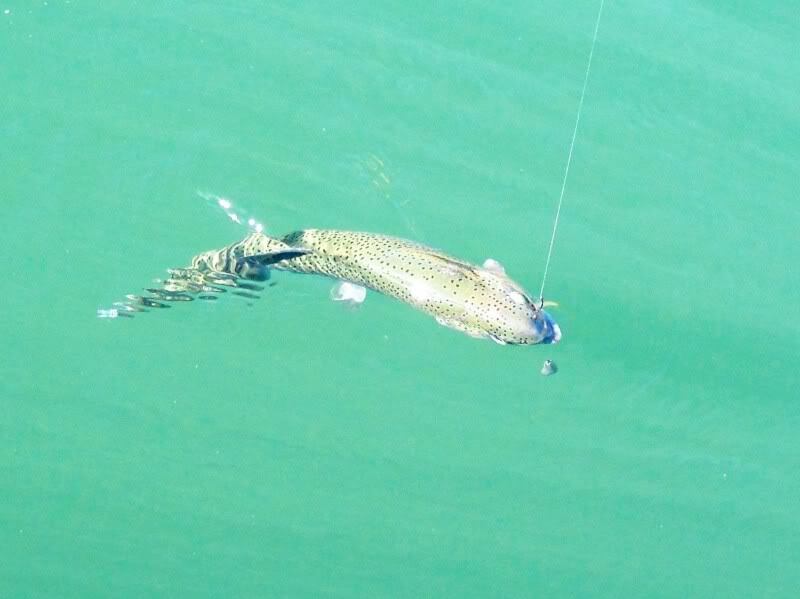 A Pyramid trout catch on a bass 'finesse' rig is a common occurrence. Note: trout stocking at Pyramid for the time being has ceased. 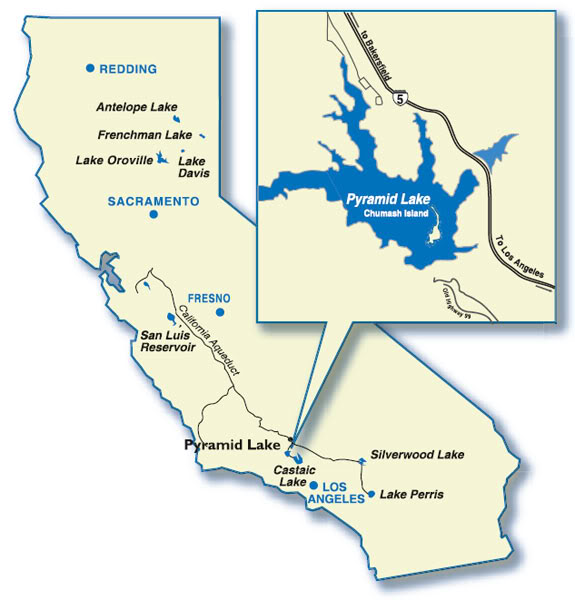 At 222,000 acres you can within a day easily sample just about everything Pyramid has to offer. Photo by NASA. 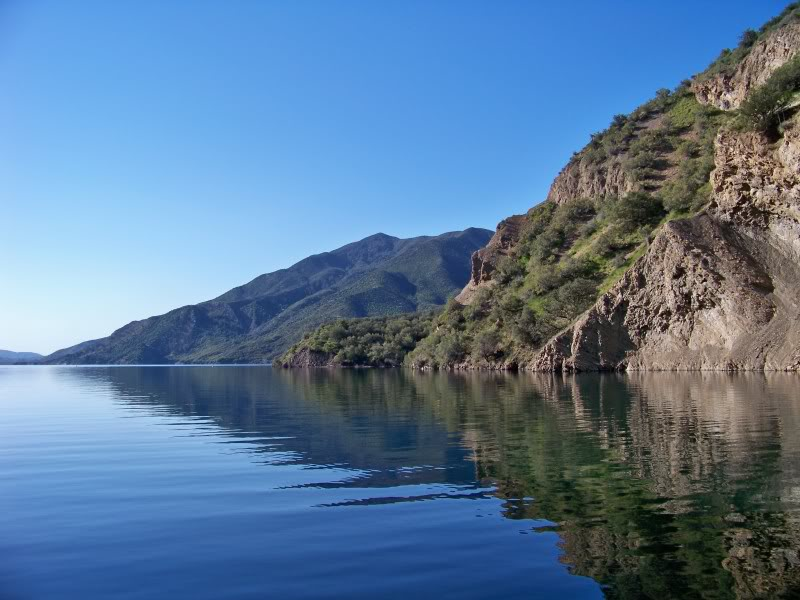 This mountainous topography provides numerous funnels and plus factors. Photo by Bill Siemantel. Wind and sunlight and the best angle is constantly changing. Steep drop offs on both sides of this spur. Another ridge line descending into the lake. 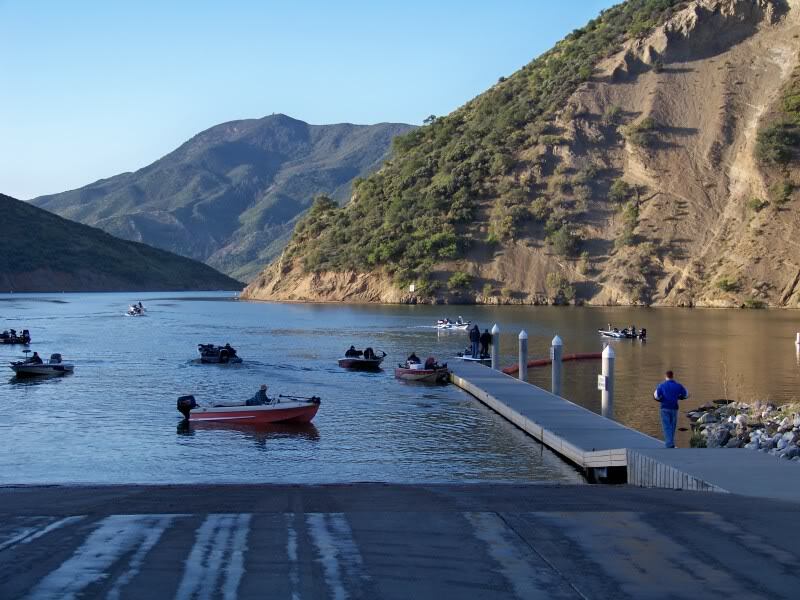 Most anglers pass right by Castaic before they begin the steep highway incline up the mountains to reach Pyramid. 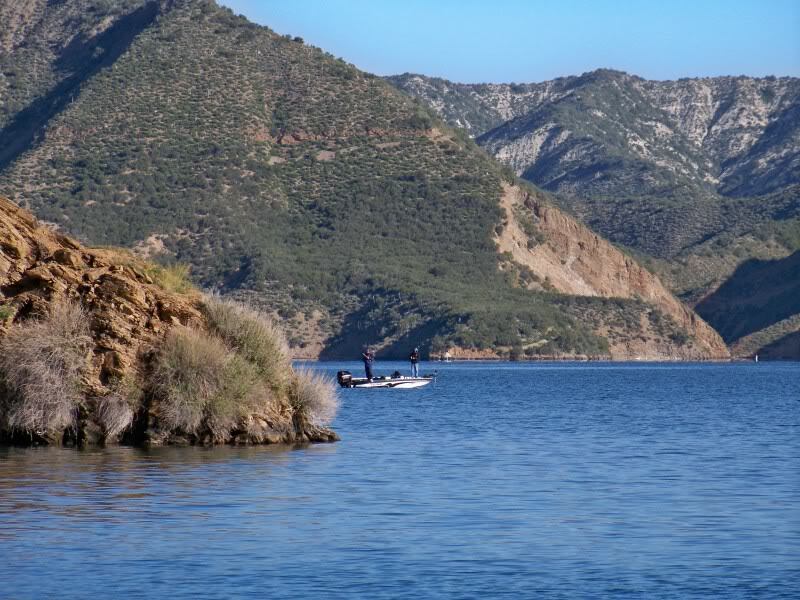 Castaic has a larger than life reputation for big Florida strain largemouth; Pyramid features northern strain bass. 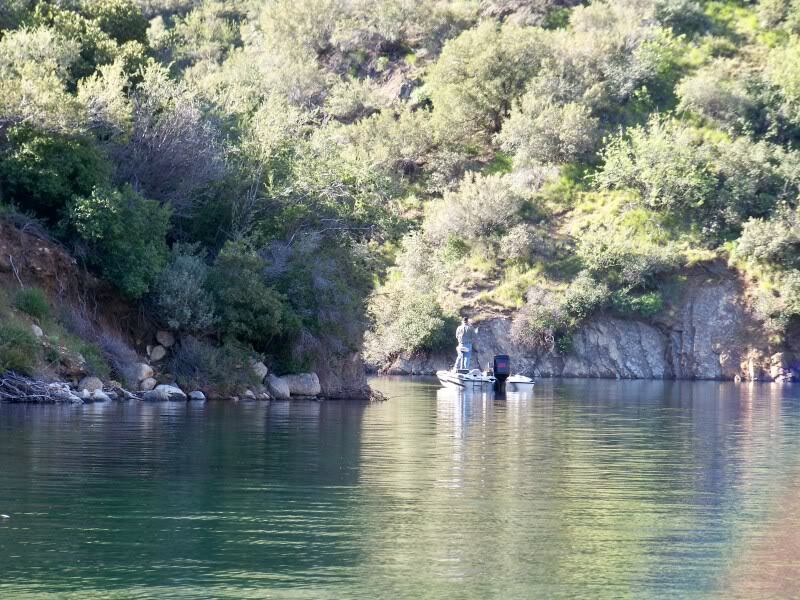 There must be many reasons why anglers do not fequent Pyramid as much as other locations. Therein lies another aspect of Pyramid's beauty; It is not on everyone's radar. The bass here are not supposed to get very large when compared to their Florida cousins. Someone forgot to tell this bass. Photo by Bill Siemantel. 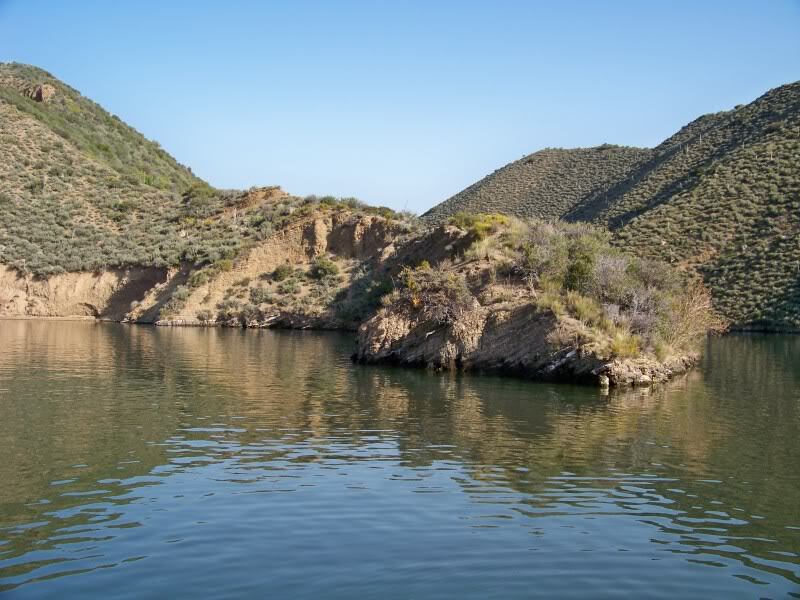 The scenario of excellent bass waters that are on trails less traveled takes place all over the country So where is your Pyramid Lake?